Voluntourism: Just quickly saving the world? - Zugvögel - Grenzen überwinden e.V. Spending holidays in an “exotic” country and at the same time saving the world a little bit: this is how offers of the so-called “voluntourism”, a term consisting of the two words “volunteering” and “tourism”, are often being presented. A combination of holidays and volunteer work might sound tempting for many and this is why it does not come as a surprise that voluntourism is increasingly becoming more popular. Especially offers of commercial short-time volunteer programs seem to be booming. Young adults from the Global North travel to countries in the Global South, usually for a very short period of time, work in projects in which help is supposedly needed and practically combine their personal claim to be “doing good” with going on holiday. We as the Berlin regional group of Zugvögel took this growing popularity as a reason to deal with the topic voluntourism in more detail. Especially, we had the feeling that voluntourism offers are often seen in way that is not critical enough. Against this backdrop, we wanted to counter such a view with our project. Thus, the idea originated to design a satirical flyer presenting advertisement for short-time volunteer services in an exaggerated way. 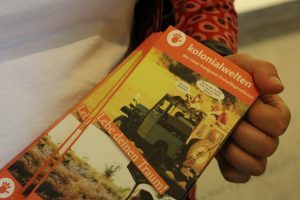 On the flyer, we presented ourselves as the company “Kolonialwelten” (‘colonial worlds’) with the design and the arguments clearly being inspired by advertising material of “renowned” providers of volunteer services. While we later distributed this promotion material as a printed version, you can take a look at the digital version of the flyer here (unfortunately, it is only available in German). It was our conscious decision to cause irritations with this flyer, to provoke a little and to uncover that first and foremost it is your CV that profits from voluntourism and that it serves well to soothe one’s bad consciousness. In a second step, on the back side of the flyer we invited people to take a look at our website www.nur-noch-kurz-die-welt-retten.org that we had specifically developed for our project. In contrast to the flyer, this website is more objective and informative. The demand we have placed on ourselves is to shed light on different aspects of short-time volunteer services and especially to encourage thinking and critical reflection. Whereas our project criticizes and questions international volunteer services in general, our critique is specifically directed towards providers of commercial short-time volunteer services. Something that was and is important to us is transparency on our own background. We, meaning the people involved in the project, have for the most part done a volunteer service ourselves in a country in Africa, Asia or Latin America. Not at all, we feel in the position to advise someone to do or rather not to do a volunteer service because if we are honest we have been profiting from it a lot. At the same time, we want to encourage to think things over, to stop for a moment and to maybe do some things a bit better than we have done. In order to call more young people’s attention to our website, and as part of a small guerrilla campaign, we took our flyers to a youth education fair in Berlin. According to the motto “ways abroad” fairs like this give providers of short-time volunteer services the chance to present their offers. They provide soon-to-be graduates from high school inspiration on what they could do after school. 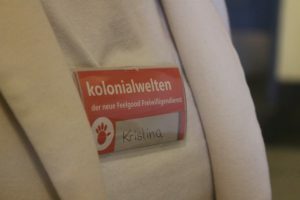 Of course, our (fictitious) company “Kolonialwelten” could not miss the chance to present itself as well…. The latest aspect of our project on voluntourism is the development of stickers. 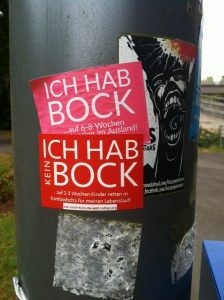 In several cities in Germany we had discovered stickers offensively advertising for voluntourism offers by AIESEC, the world’s largest non-profit youth run organisation. Their stickers à la “FEEL LIKE…6-8 weeks volunteering abroad” were countered by us with stickers saying “DON’T FEEL LIKE…2-3 weeks saving children in Cambodia for my CV“ („DON’T FEEL LIKE…6000 kg CO2 emissions for 5-6 weeks volunteering in an eco-project in Peru). It was not long until AIESEC members got in touch with us. We are in exchange on our “counter stickers”, several emails have been written and maybe we will have a real-life meeting in the coming weeks in order to exchange our views on the topic of voluntourism. Our project has definitely not yet come to an end and we are always open for new ideas. We are happy about feedback, in particular about (constructive) criticism and further additions/advice on the contents of our website.